People these days sign up for health insurance to ensure that they are ready in case of an untoward mishap. However, this is really not as easy as it seems. There are a number of medical procedures which are not covered by health insurance. Thus, doctors sometimes ask for a prior authorization from the patients’ health insurance provider to ensure that the prescription they write or the procedure they prescribe is covered under the insurance policy. It is for this purpose that the hospitals and clinics use Authorization Forms. Hospitals and medical facilities make use of this form in cases where they are unsure whether Medicare covers certain medical procedures and medicines. In this form, they fill in the details of their patient as well as the Medicare provider and their query. You may also see Medical Authorization Forms. Not all medicines are covered under medical insurance. Thus, when a patient approaches a pharmacy with a prescription fill up and an insurance request, the pharmacy uses this form to ensure that the said medicines are indeed covered under insurance. You may also see Employment Authorization Forms. Many a time doctors are required to prescribe certain drugs to help their patient. However, in order to ensure that these are covered by the patient’s medical health insurance, they use the aforesaid form to post the query along with the patient details. 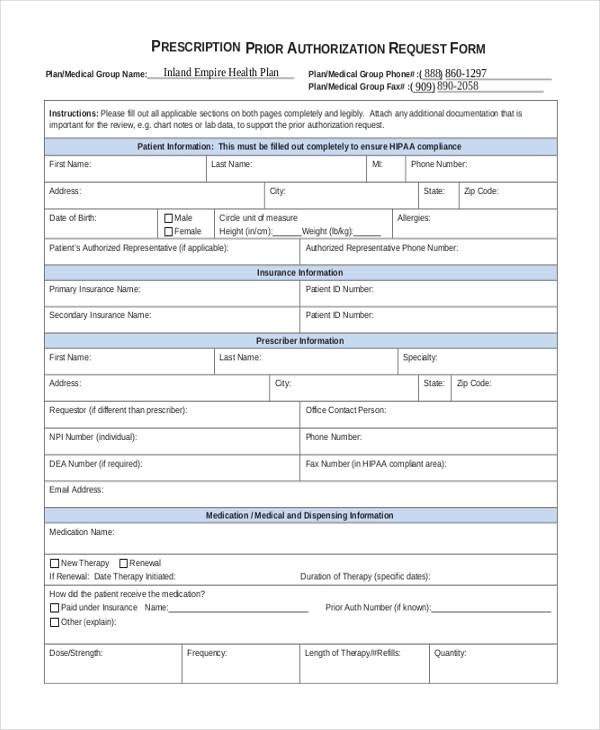 This form is generally used by hospitals and medical care centers. They use this to confirm whether certain drugs and procedures prescribed to a patient by the doctor are covered under his medical insurance policy or not. You may also see Credit Card Authorization Forms. 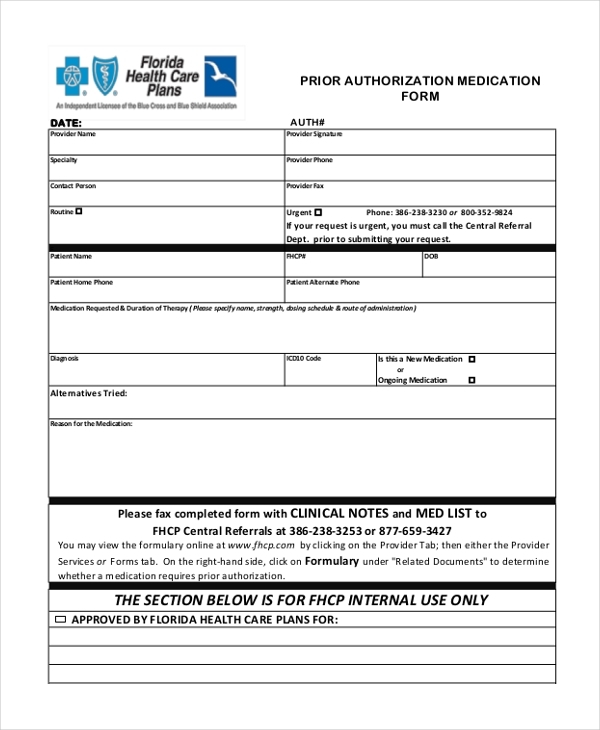 Pharmacies can use this form to get a confirmation whether certain medicines prescribed to the patient are covered by his health insurance or not. 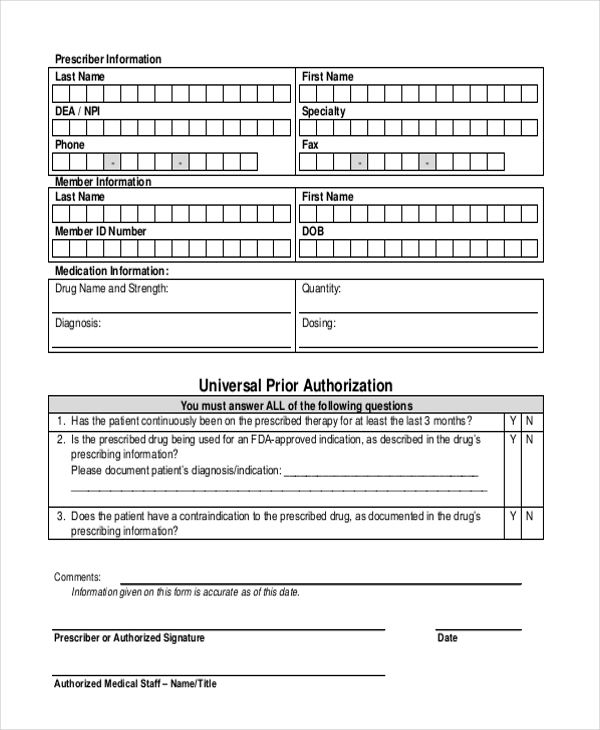 The form contains a number of segments which the pharmacy needs to fill in with relevant details like name of the patient, the name of medicine, its strength etc. 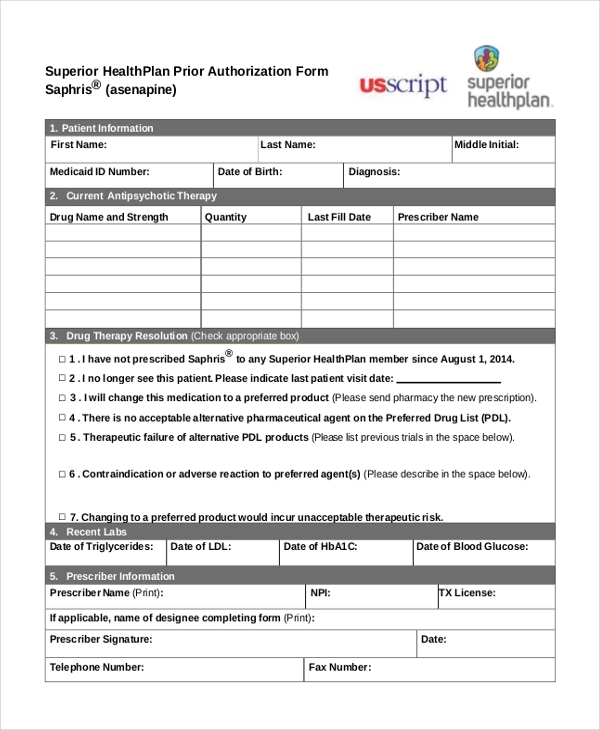 This is a general prior authorization form that can be used by doctors, hospitals or pharmacies. This form comprises of all the essential segments that should be included in such a form. The user can further make changes to the format as per his needs. Hospitals use this form to confirm whether certain medical procedures and medicines prescribed to a patient are covered by his health insurance provider or not. The form should be filled in with the details of the patient, list of the medicines and procedures and any other relevant information. You may also see HIPAA Authorization Forms. 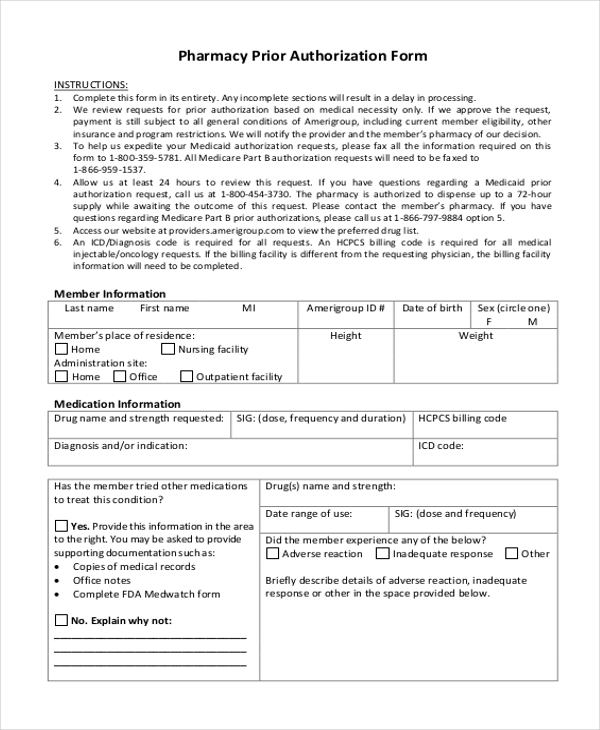 When outpatients approach a medical health facility with the request to help them use their health insurance benefits, the facility uses this form to ensure that the company does offer cover for the procedures and medicines prescribed. 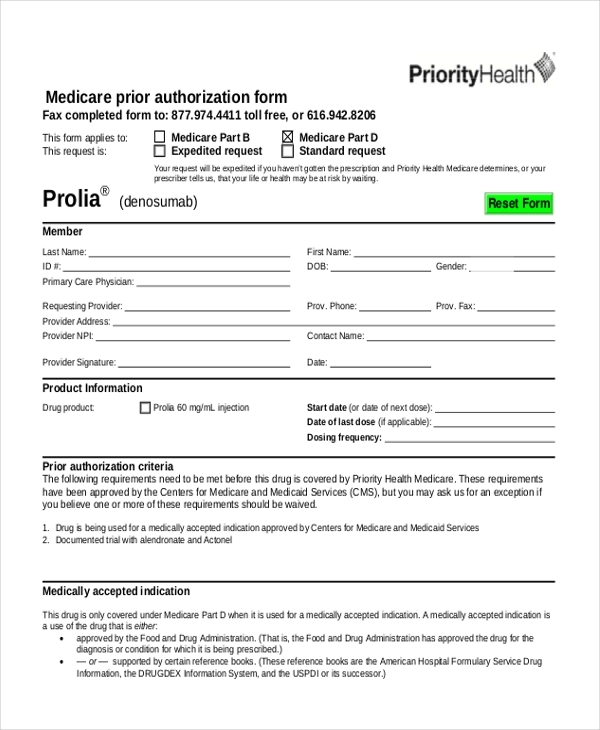 What are The Benefits of Using Prior Authorization Forms? 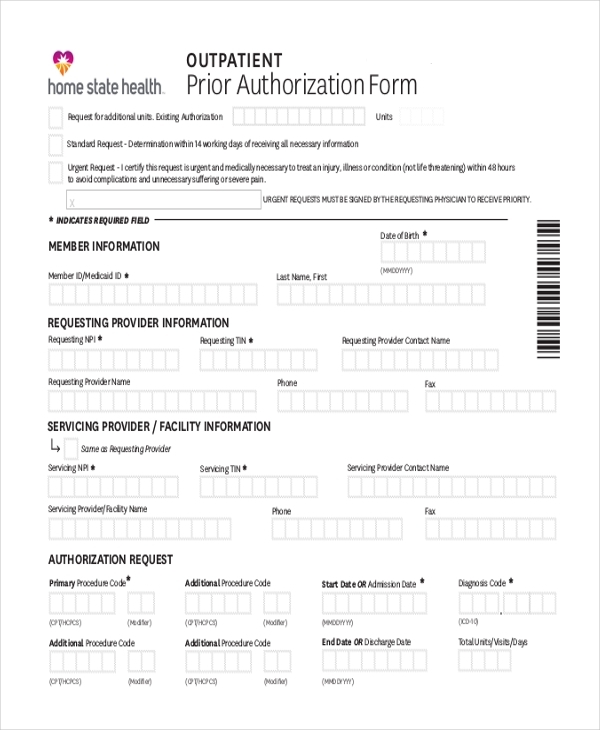 In case you are thinking of designing a prior authorization form, get some ideas from our collection of these forms. Available in PDF and MS Word format, these are compatible with all devices. Easy to download and customize, these forms allow you to design a unique prior authorization form in a jiffy, and that too without the help of a professional. You can also see Travel Authorization Forms.